Thank you for inquiring with Tiburon Landing. Waterfront bay views and nestled between the famous Napa Valley wine region and San Francisco, Tiburon Landing is a discreet and elegant private home with full SF Bay, Angel Island and SF Skyline views. Our Landing is fully equipped with luxurious bedding and linens, fine china, crystal, and upgrades throughout. Enjoy dining with picturesque surrounding views exposed through French doors and respectful privacy. Just a 5-10 minute walk to fine or casual dining, ferry boats, downtown historic Ark Row, and lovely walks through exclusive lanes of our community. Spaciously appointed with one bedroom, one bath, sleeps 4. Enjoy our luxury home for your get away. WIFI connected while enjoying full bay VIEWS! : Thank you for inquiring with Tiburon Landing. We have recently reduced rates for the season! Waterfront bay views and nestled between the famous Napa Valley wine region and San Francisco, Tiburon Landing is a discreet and elegant private home with full SF Bay, Angel Island and SF Skyline views. Our Landing is fully equipped with luxurious bedding and linens, fine china, crystal, and upgrades throughout. Enjoy dining with picturesque surrounding views exposed through French doors and respectful privacy. Just a 5-10 minute walk to fine or casual dining, ferry boats, downtown historic Ark Row, and lovely walks through exclusive lanes of our community. Spaciously appointed with one bedroom, one bath, sleeps 4. Enjoy our luxury home for your get away. ***Just a note...all owner submitted guest comments are reviews taken directly from other sites where reviews were left. Welcome to Tiburon Landing, a romantic bay view home. We love our charming home with spectacular bay views. We can enjoy watching the sailboats and huge ships passing by from our outdoor lounge, living room, dining room, kitchen and terraces. It's priceless. Private full bath with conveniently separated vanity area for privacy. Tiburon Belvedere village walking distance. Check out our incredible views from Tiburon Landing's perfect location. Private laundry facilities in home. Well appointed with fine chine and crystal as well as casual daily dishes. 2 additional counter bar seating available. 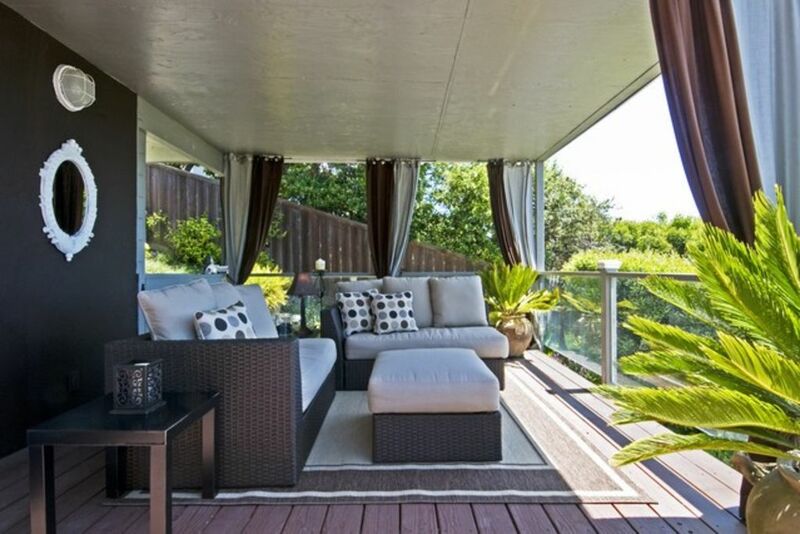 Fabulous outdoor living terrace with full bay, island and city views. Our family of four wanted to stay in a beautiful place with an ocean view where we could get away for daily excursions and be back to enjoy evenings on the deck watching the sunsets and being able to walk to town. We live an hour away, yet this home and location felt like we were far away. Our older sons loved the home as well and we could all spread out and usually ended up on the deck. The upstairs neighbors were very quiet and the home had everything we needed with a modern, well-stocked kitchen. We had breakfast in and ate out for dinner at two fabulous restaurants in town. We just stayed two nights, but went to San Francisco and took the tour bus and ate at Fisherman's wharf, we walked around Sausalito and Tiburon and the last day we took the ferry to Angel Island and rode the tram around the island. We thoroughly enjoyed our stay and would definitely stay here again and will recommend it to friends and family. Very nice and enjoyable stay with a wonderful location! We instantly felt at home at Tiburon Landing. The living room/dining area has great views, and the kitchen is well equipped. The view from the outdoor deck is amazing. Highly recommend staying here! We loved our stay at Tiburon Landing. Coffee and wine every day on the beautiful deck. Even saw deer. We walked to town every day. Hiked the trails behind the house. Short drive to lots of attractions. The house is fully stocked and was the perfect suze for our family of three. Rebekah was very responsive. We would definitely stay here again. Beautiful neighborhood with world class views. Flat was lovely as well and we would return. Our flat had everything we needed to have a comfortable four night stay. Offered great interior space and a lovely view deck. Kitchen was very well stocked and the bed put us immediately to sleep after long days exploring SF and the surrounding small towns. Quiet, lovely neighborhood with great amenities close by. Highly recommend this to anyone looking for a perfect home base to explore SF and/or Marin County. We enjoyed our stay at Tiburon Landing. The place was immaculate. Bed was comfortable. The only challenge we had was with the Ferry schedule. It made our evenings in SF short, but meant we were home early to enjoy a glass or two of wine on the balcony. If you don't have a car, bring some good walking shoes. The ferry boats are a very short walk from our home, providing a short bay cruise to Sausalito, Fisherman’s Wharf, Alcatraz, and beyond. Located 30 miles from the San Francisco or Oakland airports. Our Landing is just six miles to Stinson Beach and other small coastal villages at the shores of the Pacific Ocean and the foot of Mt. Tamalpais. Stroll around Sausalito and browse around the art galleries, boutiques and restaurants along the famous and historic Tiburon Ark Row. Tiburon was a safe haven for sailors in centuries gone by. Tiburon Landing is also convenient to the lush 560-acre Muir Woods National Park renowned for the grandeur of its redwood forest. The Pacific seaboard architecture and exotic merchant trade of the San Francisco Bay inspire the décor and style at our Landing. French doors compliment full view exposure to islands, bay and San Francisco skyline, and a rich collection of art and fine crystal add to the elegance of Tiburon Landing. Rates are subject to change until reservation is confirmed. Rates are based on 2 guests, additional guests $50pp/pn.